This set of Analog Circuits Multiple Choice Questions & Answers (MCQs) focuses on “Voltage-Ampere Characteristics of Diode – 1”. Explanation: PIV stands for Peak Inverse Voltage. It is the maximum reverse bias voltage which a diode can bear without breakdown. 2. What is meant by the PIV rating of a diode? Explanation: PIV rating indicates the maximum allowable reverse bias voltage which can be safely applied to a diode. If a reverse potential is greater than PIV rating then the diode will enter reverse breakdown region. Explanation: The voltage after which a diode increases rapidly is known as the offset voltage, threshold voltage, firing potential and cut-in voltage. Beyond this voltage, the forward bias voltage overcomes the potential barrier and rapid conduction occurs. Explanation: Diode equation is I=IO(eqV/kT – 1). It is applicable in all bias condition that is forward, reverse and unbiased states. Explanation: Emission coefficient or ideality factor accounts the effect of recombination taking place in the depletion region. The range of factor is from 1 to 2.For Germanium it is 1. Explanation: Emission coefficient or ideality factor accounts the effect of recombination taking place in the depletion region. The range of factor is from 1 to 2.For silicon it is 2. 7. What is the value of the voltage equivalent of temperature at room temperature (27oC)? Explanation: Voltage equivalent of temperature VT is equal to the product of Boltzman constant (J.K-1) and temperature in Kelvin. At a temperature of 27°C, it’s value is VT=KT/q=26mV. 8. What happens to cut-in voltage when the temperature increases? Explanation: As temperature increases the conductivity of a semiconductor increases. The diode conducts smaller voltage at larger temperature. Therefore, cut-in voltage decreases. Explanation: As temperature increases the conductivity of a semiconductor increases. Reverse saturation current increases as temperature increases. 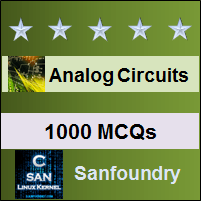 To practice all areas of Analog Circuits, here is complete set of 1000+ Multiple Choice Questions and Answers.